For precautionary reasons, we need to take some things under considerations before we drive under rainy conditions. 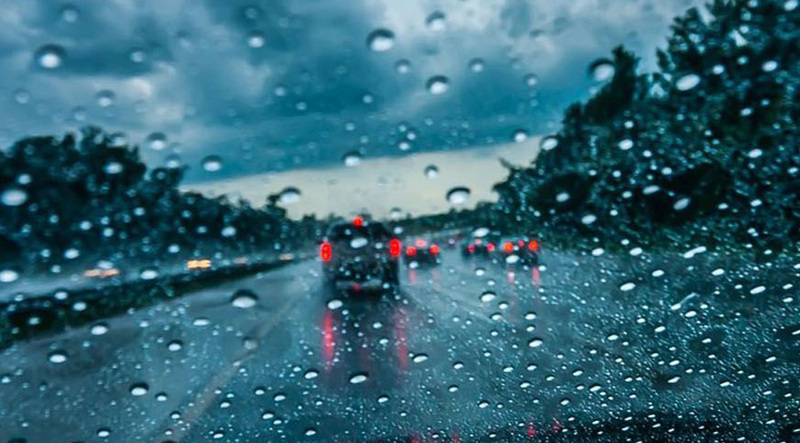 Rain and humidity increase the chances of damage to our vehicle, as electrical and electronic parts, especially in older cars and motorcycles, are sensitive to these weather conditions. When driving under these circumstances it is necessary to take precautions in order to avoid an accident or damage. • The coefficient of friction of asphalt decreases dramatically and sliding increases. • The tires do not heat up, reducing further the grip. • Dyed sections of the tarmac (separation strips and crossings) give even less adhesion. • Visibility is diminishing (car and truck crystals and motorcycle gelatins blur). • Signs and traffic lights become inconspicuous for everyone. • The puddles fill with water, become indistinct and their depth is not easily detected. • The sewer grills are blocked by trash drifting down the road, and the water floods the road and especially the underground passages. • We plan our route by avoiding places that usually get flooded. • We leave earlier because rain driving imposes lower speeds and may cause unforeseen delays. • We reassure the good operation of our windscreen wipers and lights, without neglecting the control of fog lights. • We get update of the latest weather data, road conditions (traffic jam, floods) from weather reports and road conditions. • We check the road assistance contact details in case we stop. • We are assuring the good status of the triangle, pharmacy and reflective waterproof that we always owe to have in our vehicle. • We are assuring the secure fastening of loads in our vehicle. • We turn on the middle lights to make them visible to everyone (pedestrians & drivers) even during the day. We drive at low speed. • We observe the movement of heavy-duty vehicles which, due to their size, emit large amounts of water and are blocking our visibility. • We drive at steady speed and make gentle movements, anticipating road conditions. • We do not drive at high speeds nor do we overtake at low visibility spots. – We lower speed and we pass with great care keeping the low gear. Rapid driving on stagnant water can lead to damage and may result in loss of control and risk for pedestrians and other drivers. – We do not drive inside lakes of water if we are not sure for the depth. The edge of the pavement can give us a picture of the depth. – We drive to the highest point of the road. – We do not drive in moving waters because they can drift us. For this reason we are especially careful when moving near river beds, lakes or the sea. • The phenomenon of water logging is the main cause of loss of adhesion on wet roads. If the car’s speed is greater than recommended, a layer of water may be created between the pavement and the tire resulting in loss of adhesion. How do we react? 1) Keep the steering wheel steady in the way we have chosen. 2) We do not brake abruptly. 3) Reduce the speed by leaving the throttle or if possible lowering the speed. 4) We wait for the tires to recover their grip.